The spot-workaround was to create bypass rules for the individual sites to allow all users to pass without authentication, which was by no means a elegant since it was a reactionary approach that waited for user’s to get locked across various offices and then report the problem to tier 1 and then escalate. The Windows Kerberos authentication package is the default authentication package in Windows Server 2003, in Windows Server 2008, and in Windows Vista. It coexists with the NTLM challenge/response protocol and is used in instances where both a client and a server can negotiate Kerberos. Request for Comments (RFC) 1510 states that the client should send a User Datagram Protocol (UDP) datagram to port 88 at the IP address of the Key Distribution Center (KDC) when a client contacts the KDC. The KDC should respond with a reply datagram to the sending port at the sender’s IP address. The RFC also states that UDP must be the first protocol that is tried. RFC 4120 now obsoletes RFC 1510. RFC 4120 specifies that a KDC must accept TCP requests and should listen for such requests on port 88 (decimal). By default, Windows Server 2008 and Windows Vista will try TCP first for Kerberos because the MaxPacketSize default is now 0. 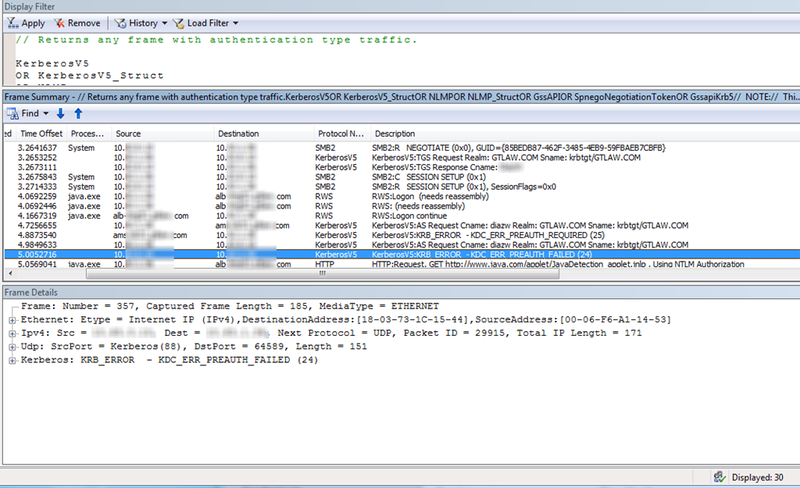 You can still use the MaxPacketSize registry value to override that behavior. By default, the maximum size of datagram packets for which Windows Server 2003 uses UDP is 1,465 bytes. For Windows XP and for Windows 2000, this maximum is 2,000 bytes. Transmission Control Protocol (TCP) is used for any datagrampacket that is larger than this maximum. The maximum size of datagram packets for which UDP is used can be changed by modifying a registry key and value. Previous to the change that is described in the "Summary" section of this article, programs could use the Win32 LsaCallAuthenticationPackage API specifying KERB_RETRIEVE_TICKET_REQUEST and either KerbRetrieveEncodedTicketMessage or KerbRetrieveTicketMessage message types to retrieve a Kerberos ticket-granting-ticket (TGT) and the associated session key. After applying on a couple labs, the Java applets were no longer passing any Kerberos traffic, avoiding the failed authentication altogether. That being said, I am not ready to call this a solution. There is no doubt a bug (or a change that needs to be documented properly) in Java 7 as we did not see this in any JRE 6 and it needs to be addressed. Further, I haven’t yet fully grasped the security vulnerability involved in applying this to an enterprise environment with thousand of workstations. Perhaps a Kerberos configuration file may actually resolve in our case but that still needs to be investigated. Due to the potential security impact, we have not enabled this registry workaround yet. This entry was posted on August 16, 2013 at 7:43 pm	and is filed under Troubleshooting. Tagged: Java, Networking. You can follow any responses to this entry through the RSS 2.0 feed. You can leave a response, or trackback from your own site. Creating a krb5.conf file per PC provided a downright excellent workaround for our environment. The user lockout problem bedeviled us for months before coming across this post. Mega Kudos for taking the time to investigate and share!